Here are my notes from my first impression of Colonel Muammar Gaddafi’s second son, Saif al-Islam. 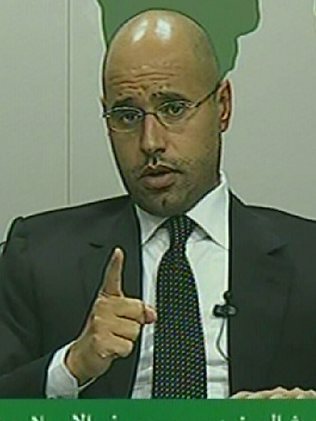 At the time, July of 2007, Saif al-Islam was Gaddafi’s favorite and his likely successor. I was in Nice, France with the Libyan dictator’s son. My job was to arrange media interviews, primarily with the European press, to discuss Libya’s decision to release a group of Bulgarian nurses falsely accused of infecting Libyan children with HIV. Libya had arrested the nurses years earlier, tortured them and imprisoned them in horrendous conditions. They were now releasing the nurses as part of negotiations with the European Union. Earlier in the year, my agency (not my current place of employment) had been working with a client assisting Libya in restructuring its economy to allow for foreign and private investment and private ownership for Libyan businesses. It was a step toward more economic freedom for the North African nation. As part of that assignment, we had arranged for a debate on “democracy” between Gaddafi and two Western academics hosted by David Frost (that’s a story for another day). Now, months later, the Libyans contacted us to help to arrange for media interviews for Gaddafi’s son to discuss the release of the nurses. I visited Libya much earlier and had urged officials there to free the nurses. Obviously, there was incredible pressure from the West for the release, so I am by no means suggesting that I was anything more than another small voice pushing for the nurses to be returned to their families. But I had made a PR case for releasing the nurses to one of Gaddafi’s closest advisers a week before the nurses were freed. The goal of the interviews in France was to position Saif al-Islam as the “compassionate” leader of Libya in waiting. Libya was “expelling” the nurses to focus on the sick Libyan children still struggling with HIV and would be announcing monetary aid for the children and their families. From a hotel set along the pebbled coastline of Nice, we invited reporters from Newsweek, Time, BBC, Le Monde and Reuters to interview the dictator’s son. It was an exhausting and stressful few days. Saif al-Islam went completely off script – in a rambling, almost incoherent manner – and shocked us with his candor. However, his interviews with the media were often chaotic and disjointed affairs and he often contradicted himself. Unfortunately, Saif al-Islam downplayed the torture of the nurses and his manner about their fate was unemotional. And new reports had surfaced that France had enticed the Libyans to release the nurses with a proposed nuclear energy deal. So the media we had arranged exclusive interviews for were frothing at the mouth at these developments. It overshadowed a lot of what the dictator’s son was actually saying. But they noticed back in Libya. I responded that I had no control over what Saif al-Islam said and that it was his decision – and his decision alone – to discuss a Libyan constitution and free elections. Frankly, I agreed wholeheartedly with a lot of what he said. I was ordered to cancel any remaining interviews, but we had already finished all of them. One wonders how that experience in France more than four years ago shaped the actions of Saif al-Islam this week as the Libyan people struggle to overthrow his father’s harsh regime. As the revolution took to the streets and state-sponsored violence erupted, Saif al-Islam appeared on Libyan television this week vowing that the Libyan government under his father “will fight to the last minute, until the last bullet.” He warned of “rivers of blood” if the protests continued. Clearly, those were not the words of the moderate son I met in France. And with reports today of terrible and bloody violence against the protesters, many are dismissing Saif al-Islam as a pretender for democracy and not a real moderate. Has Blogging Entered its Twilight? Nice piece George. I was wondering when you’d have something to say on the subject. You’ve been waiting for this unrest–just-waiting, haven’t you?–to tell the world this story. Well, I for one am not impressed. Ok, maybe just a little. Who is handling Gaddafi’s public relations now? That I don’t know. But clearly and unfortunately Saif al-Islam has abandoned any pretense of his previous moderate views. No one seems to know, but Monitor Group sent Richard Perle to Libya in 2006. Regime definitely working with PR firm and have started to listen. Gaddafi clearly cleaned up his act at last press conference. Saif sticking to talking points. Got new face with the press (see Anderson Cooper Mar 2&3) Need to expose them and bring pressure to drop them as clients. They have blood on their hands. Monitor isn’t a PR firm. It’s a business and management consultancy. With all due respect to the media parties involved in the “breaking” news that Libya was a client of Monitor Group. It wasn’t exactly a secret. Monitor was pretty transparent about it and, in fact, the New York Times, AP, Reuters, BBC and the UK Guardian (and many other media groups) were invited guests to events in Libya organized by Monitor. The media participated and wrote about them. So what is the news here? If Monitor is the “bad guy” here then why aren’t the media members who participated in the events being held culpable as well? Reason I’m interested in the PR is that I saw drastic change overnight. Gaddafi cleaned up, more statesmanlike in his press conference. Saif out with his talking points. New spokesman to press. They got help from the West to talk to the West and I’d just like to know who it is. Name them and point out they have blood on their hands. Not exactly good image for a Public Relations firm.